Habit: Plant green, generally with sparse, +- appressed hairs. Leaf: petiole 7--15 mm, blade 30--60 mm, narrow-lanceolate, base hastate (or cordate to wedge-shaped). 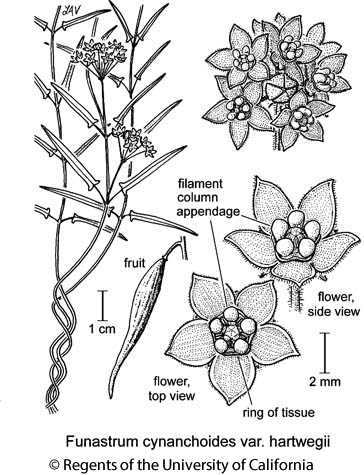 Flower: corolla 4--8 mm, pink to purple or lobes white, each with purple streak centrally, ring of tissue at base free from filament column appendages, lobes +- spreading to +- erect. Fruit: generally 1, 7.2--11.2 cm. Unabridged Note: Putative hybrids with Funastrum cynanchoides var. cynanchoides (leaf wide-lanceolate, base cordate, rarely truncate; 2n=20; southern Arizona to Arkansas) in low numbers in areas of geographic overlap, despite the fact that Funastrum cynanchoides var. cynanchoides begins to flower nearly 2 months later than Funastrum cynanchoides var. hartwegii. Citation for this treatment: Thomas J. Rosatti 2012, Funastrum cynanchoides var. hartwegii, in Jepson Flora Project (eds.) Jepson eFlora, http://ucjeps.berkeley.edu/eflora/eflora_display.php?tid=80428, accessed on April 22, 2019. SCo, PR, D; Markers link to CCH specimen records. Yellow markers indicate records that may provide evidence for eFlora range revision or may have georeferencing or identification issues. Purple markers indicate specimens collected from a garden, greenhouse, or other non-wild location.